We are Chartered Building Surveyors, Design Consultants and Project Managers based in Twickenham. 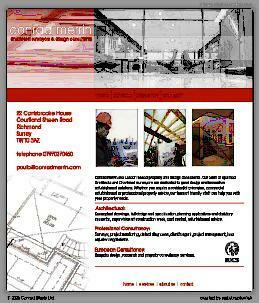 We specialise in Architectural design and refurbishment work to existing buildings. We work throughout West London but most of our work is concentrated around Twickenham, Richmond, Kingston, Teddington, Surbiton and Wimbledon. Whether you need plans for an extension, a building survey or a commercial refurbishment, our team of friendly staff can help you with your property needs. Architectural Design: We design residential extensions, loft Conversions and refurbishment schemes. We provide a complete Architectural design service. Building Surveying: We undertake the full range of building surveying services including building Surveys, defect analysis, schedule of repairs, condition surveys, lease plans, dilapidations, cost plans, and bespoke property services. Project Management: We Project Manage commercial and residential schemes, including Mansion blocks, flats, office fit outs, health care refurbishments, new build projects and residential development. Our fees are dependent on the work required.